UPDATED: Wed., Sept. 20, 2017, 9:51 p.m.
Fourteen states plan to stick with the Paris Climate Accord even if President Donald Trump pulls the country out, Jay Inslee and other governors said Wednesday in New York City. 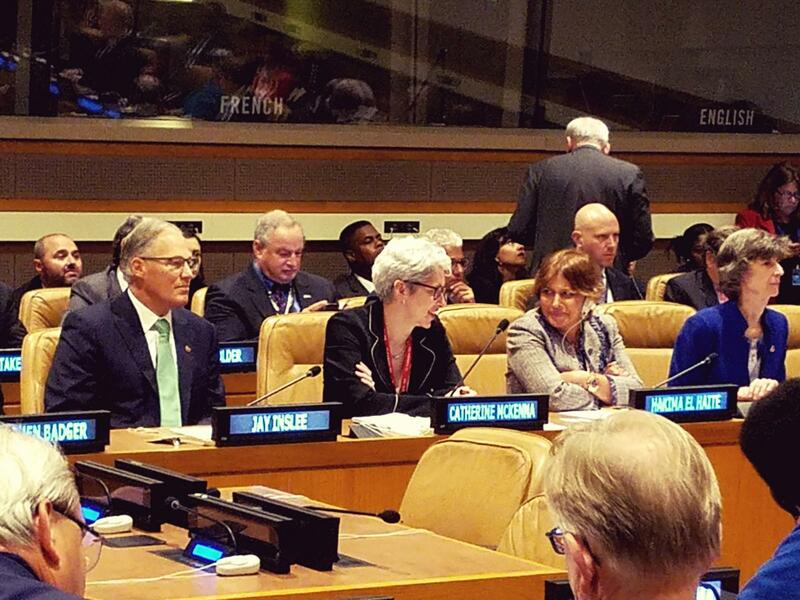 Inslee joined fellow Democrats New York Gov. Andrew Cuomo and California Gov. Jerry Brown to say a “U.S. Climate Alliance” of those states and Puerto Rico will continue cutting carbon emissions and taking other steps to fight climate change. They argued that Trump is wrong in his belief that taking steps to fight climate change is bad for the economy. Instead they represent a chance to spur innovation and meet a growing worldwide demand. A recent study shows the states in the alliance are on track to reduce their carbon emissions by as much as 29 percent to meet targets in the Paris agreement. Cuomo accused the federal government of being in “a state of denial” when it comes to climate change, which the vast majority of climate scientists believe is happening. “If you deny a problem, then there’s nothing to solve,” Cuomo said. That means there’s no incentive to find innovative solutions. If the economies of the states in the alliance were combined, they’d represent the third largest economy in the world, Brown said. Published: Sept. 20, 2017, 5:37 p.m. Updated: Sept. 20, 2017, 9:51 p.m.